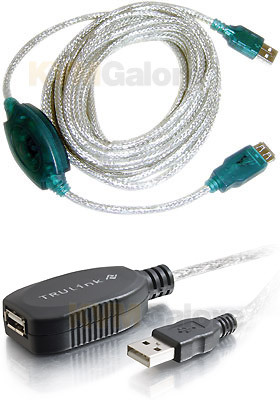 USB Type-A male to Type-A female active extension cables are designed to extend the reach of your existing USB A/B cable. These USB active extension cables are the ideal solution for USB applications which require more cable length than the 16.5 foot length limitation of USB. They actively buffer the incoming and outgoing signals to ensure compliance with USB 2.0 specification for electrical and timing minimums. Both low and high speed USB devices will function equally well with the USB active extension.